Besøk to premier Maya arkeologiske steder på en dag: Tulum og Coba. 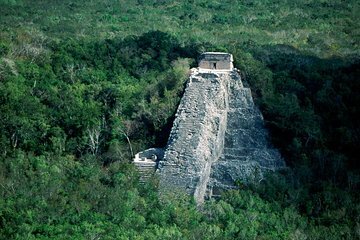 Beundre fantastisk utsikt over Det karibiske hav mens du utforsker Tulum-ruinene med en sertifisert guide, og deretter klatre til toppen av Nohoch Muul, Yucatáns høyeste pyramide ved Coba. Du hører historier på et lokalt Maya-samfunn og setter deg ned for en regionalt inspirert lunsj. Transport tilbys fra Cancun. Loved this trip! There was a problem with the van we were originally scheduled on, but they quickly got us with another group and we were picked up only 5 minutes late. The tour was fantastic and the tour guide was so nice and very goood about speaking in both Spanish and English. He was knowledgeable about all of the sites, and the provided lunch was the best authentic Mexican food we had while on our trip. Highly recommended! This tour was very disorganized. We paid for a small group tour, but when we got to Tulum, we were combined with other vans for a group larger than a tour bus. We were handed off from guide to guide, the tickets weren't ready when it was time to enter, end result we got 45 minutes inside Tulum and only because we ditched the group. We had a group of 7 who were always late returning and yet nothing was said to them. We had a flat tire on the way back not their fault, of course which took 90 minutes to get repaired no spare!. Instead of taking us back to our hotels, the group that was always late wanted to go into Playa del Carmen and were late again! Got back to our hotel after all the restaurants were closed and had another excursion leaving at 7 AM the next day. We saw what we wanted to see, but we could have just taken a taxi and done the same trip better ourselves. Would not go to the end of the block with these people. id not get back to Hotel until 7pm. Our van did not have a tour guide and I think we were at a disadvantage from the other 2 vans that did. We met our tour gulde at Tulum. No guide at Coba. Lunch was second rate compared to Chicken Itza.